In the Persian calendar, July 2013 is roughly corresponds to the 4th month of the Persian year 1392, Tir. New car production slows down its freefall somehow this month, down ‘just’ 31% year-on-year to 51,315 units, bringing the year-to-date total after 4 months to 155,425 units, down 47% on last year. This slowdown is mainly due to the two most popular models behaving fairly well and a couple of new models improving year-on-year. The [SAIPA] Pride is actually up 3% to 24,620 units, or nearly half the entire car production in the country this month! The year-to-date total is still in negative at 73,565 units, down 32%. The Peugeot Pars is down a very reasonable 9% to 6,252 units, to be compared with -58% for the Peugeot 405 and -57% for the Iran Khodro Samand. 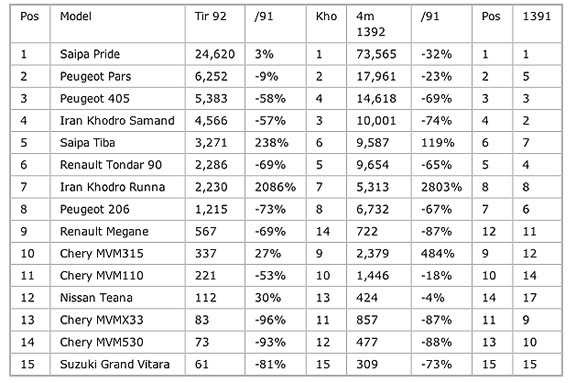 The Saipa Tiba is up 238% year-on-year and one spot on last month to #5 with 3,271 units while the Iran Khodro Runna is up a huge 2086% to 2,230 units, for both models their best monthly scores so far in the Persian year 1392. 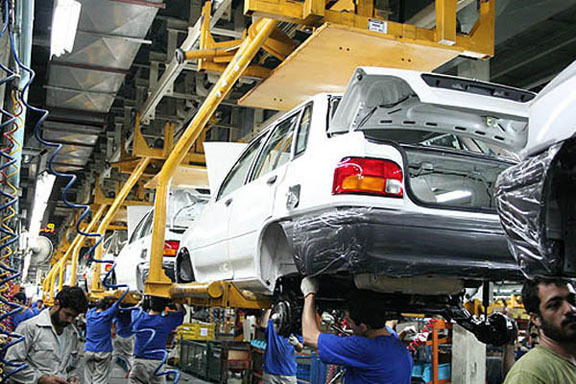 Iran auto industry production appears to be stabilizing, following adverse effects brought on by U.S.-led sanctions aimed at blocking or deterring foreign industry involvement with the country. But like Iran's determination in spite of all the obstacles to continue forward with their civilian nuclear power program, the Iranians seem equally attached to their domestic auto production programs. My apologies for being a couple weeks late with this. except few people in nord tehran enclave, who has money to buy a grand vitara ?